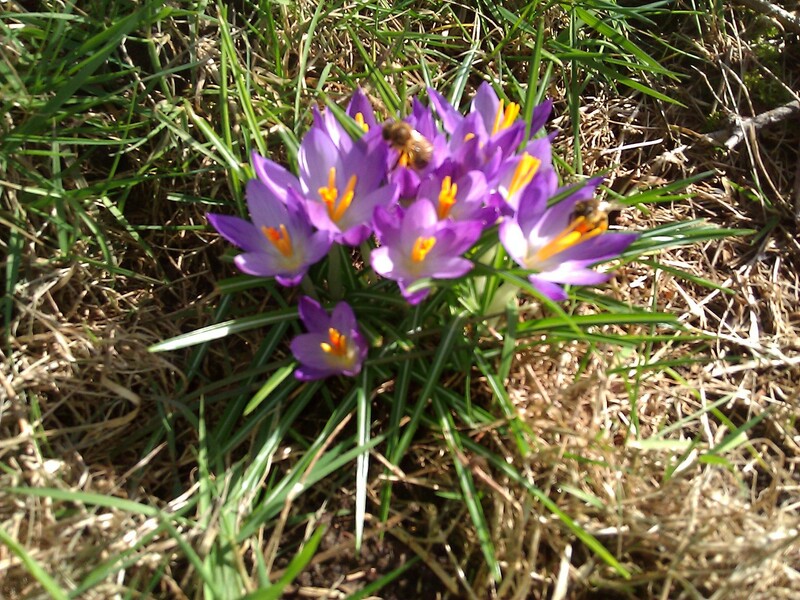 The crocuses (with bees!) today. The hive with a small blanket of snow (Sunday). I went into winter with one queenless hive (Themyscira) and one hive going strong (Galactica). I’ve figured that the queenless hive probably wouldn’t survive the winter, and have been hoping that the other one would survive so that I can try to split it and grow a new hive in the spring. However, there has been NO activity at the hive entrance for months, even on warm-ish days. So worrisome! 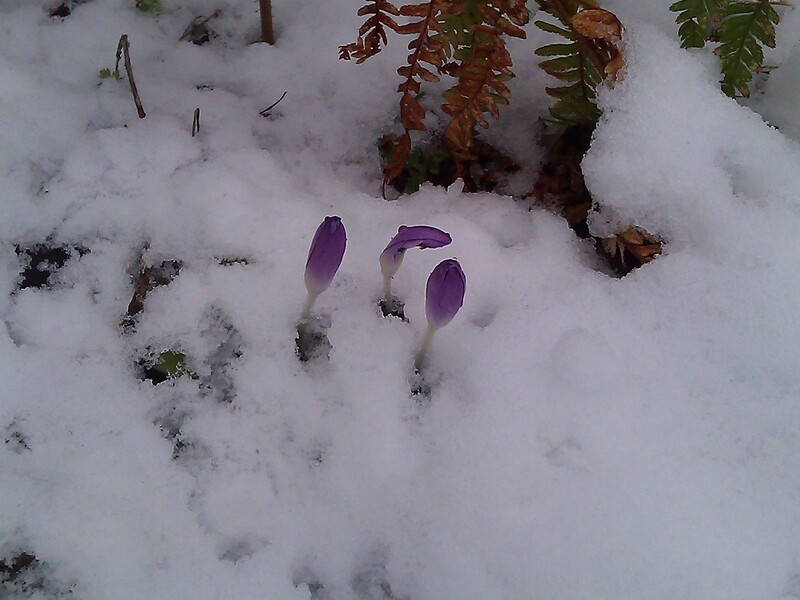 Today was a lovely false-spring day, following snow(!) 4 days ago. 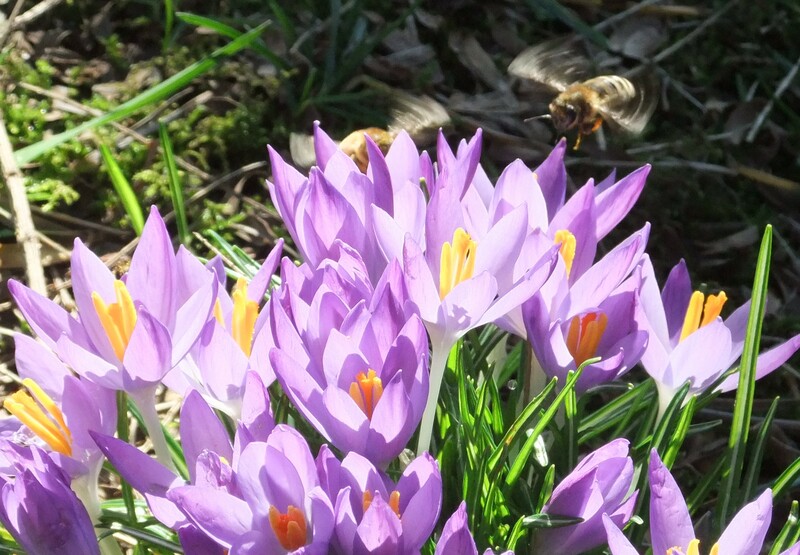 The Galactica bees flocked to the newly blooming crocuses in the front yard and returned to the queen-ful hive laden with bright yellow pollen. Hooray! I peeked at the Themyscira hive and saw no activity on the landing pad and no bees in the top box. I suspect they have all died, but I am not planning to give them a good look for a few weeks yet. Hopefully Galactica will hang in there and I can successfully split it! A yellow jacket eats a bee. Depressing. Yes, the title is true. The queenline of Thymescira hive has been lost and the hive is slowly dying out as we head into fall. The remaining bees are hanging in there longer than I expected. My hive has been queenless for almost 2 months now, and there are still bees heading out to forage. I keep hoping that they know something that I don’t – perhaps that the queen is just out on a mating flight and will be home soon. But I am pretty sure that is a futile line of thinking. I am comforting myself with thoughts that at least they are making more honey while the sun shines. I will toast them with a slice of honey toast this winter. Meanwhile, I need to improve my honey harvesting techniques. Every time I pull frames for harvesting, I end up with a robbing situation. This last time I solved it by bringing the frames into the basement, but then I had to contend with robber bees in the basement. I let them spend the night in a closed room. In the morning, I opened the door to the outside world, and most of the bees chose to fly away. However, I am still vacuuming up bee carcasses from that adventure and would prefer to avoid robbing in the first place. I have seen one-way exit door for bees and think I might have to given them a try. My biggest success this fall has been using yellow jacket traps. My hives were attracting abundant yellow jackets, which were driving both the bees and my family a little insane. The day I witnessed a group of yellow jackets hanging out near the hive entrance and slowly picking off my foragers was the last straw. One poor girl got her head ripped off right before my eyes. I marched straight into the house and clicked “buy now” on two yellow jacket traps. Now there is one hanging near out outdoor eating space and one by the hives and we are all happier. Those traps are effective! I am wondering what took me so long…. Soon, preparations for winter will begin. The chill is in the air. I am going to break out my trusty quilt again for the surviving hive and hope for the best! In the bottom center of this photo you can see a supercedure cell! The great thing about my hives’ new rooftop location is that I can see the landing boards from my son’s room. This means I make up a lot of excuses to go in there, which has the side-benefit of my son’s room being much cleaner than it used to. It also means that I am now keenly aware of my bees’ comings and goings, which sometimes causes consternation. For example, there are a whole lot of bees just hanging out on the landing board at all hours of the day. What are they doing there? Are they on time-out? Are they granny bees rocking in tiny rocking chairs? Are they the juvenile delinquent bees hanging out for a smoke? I just don’t know. But there they are. A benefit is that I have a better sense when something is up with the hive without having to open it. So, when my stronger hive suddenly stopped sending out as many foragers as my normal hive, I was tipped off that something might be wrong. A hive inspection showed dramatically fewer bees than the previous inspection (about 4 weeks before). And two queen cells. 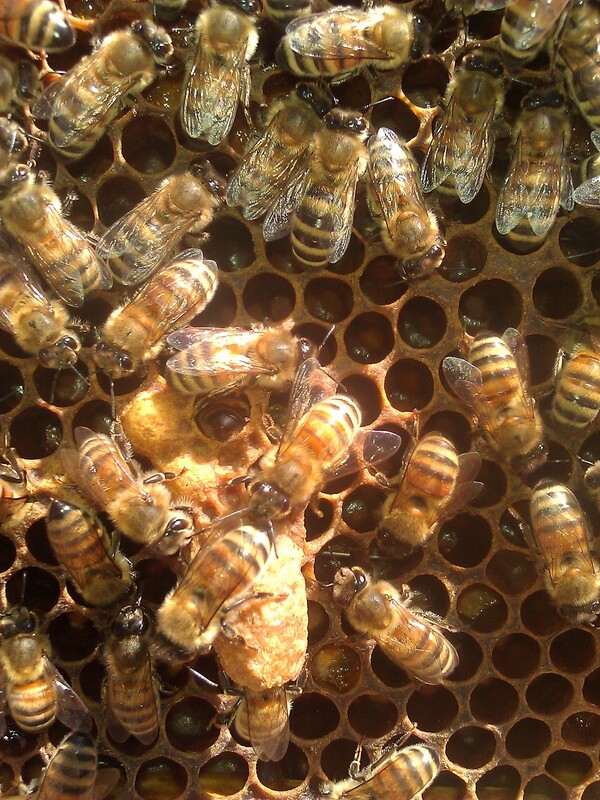 Queen cells are special brood cells made by the worker bees when they need to replace their queen (a process called supercedure) or when they want to swarm (and therefore need a second queen). If the hive has gotten so robust that it wants to split itself in two, it will make “swarm cells” or queen cells at the bottom of a frame of brood. This is the bees’ way of planning ahead. They know they want to make a queen. Queen bees are much bigger than worker bees. So, they make the queen cells in a place where they can make them large. A few thousand bees depart with the existing queen and head for the hills, looking for a new location for their live. The remaining bees raise a new queen and hope for the best. When a queen is failing or dies, the bees are in a bit of a pickle. They have not planned ahead for this! So, they take the youngest larvae they can find and start feeding them royal jelly – a substance made by the worker bees that triggers the development of the larva and makes her queen material. Since the egg has already been laid – usually somewhere in the middle of the frame – the bees build the queen cell out into the free space between the frames. It kind of looks like a peanut shell has been stuck to the frame. My frame had two of these peanuts. Now that it is late summer and my hive is queenless, my earlier aversion to regicide has been called into question. Had I replaced the queen in May, my bees would have reared a new queen, packed away the nectar and be starting to raise winter bees at this point. Instead, my dwindling bees are foraging for nectar and raising a new queen but NOT packing away the massive stores of honey they will need to see themselves through winter, nor are they raising winter bees. This could be their doom. What the hive is getting right now is a break in the brood cycle, and right at the peak of varroa mite season (thus the mite population will be beaten back). So, it could work to their advantage. 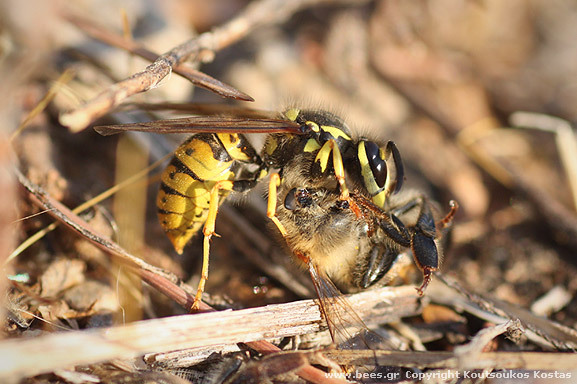 If a queen hatches, flies off to the mating grounds, successfully mates and returns to the hive without getting eaten by a bird or other predator, then the hive might just have enough time to raise winter bees and hunker down for the cold season. I can supplemental feed the hive if they don’t bring in enough honey (Not exactly letting nature take its course, but cheaper than starting over and with the benefit of continuing this queen line). Through my lack of blogging for the past several months, I can deduce that I am significantly less anxious about beekeeping in year two than I was in year one! July finds both hives doing well and requiring little attention (for the moment), so I will attempt to recount the happenings of the winter and spring. In November, we began construction on the back of our house, adding a room off the kitchen, which we designed to be sturdy enough to house the hives and some raised beds on the roof. I had hunkered the hives down for winter with the quilt boxes that Dave and I had built, fully expecting to move them onto the roof in February or March, well before they were raising brood and while they were still happily nested into two boxes for overwintering. 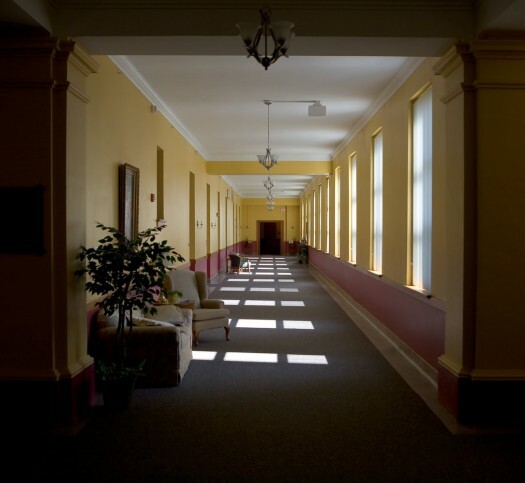 However, this being a construction project, the anticipated 6-8 week project grew into a 6 month project. As spring wore on, a pit settled in my stomach as I wondered how on earth I was going to hoist my bee hives, now full of bees raising yet more bees, and actively leaving the hive in search of forage, up onto the roof. I enlisted our contractors for ideas. One brought out a beekeeping buddy, and the two of them discussed complicated strategies, including building temporary scaffolding; or two ladders placed side by side with the hives strapped to a board which they would shoulder as they scaled the ladder; a winch; one guy on the roof with a rope stabilizing the hives while two others shouldered the hives. All of these ideas made my anxious: the potential for dropping the hives and having angry bees stinging the contractors seemed great. I started to wonder if we should leave the bees on the round until winter. Of course, I was also chomping at the bit to landscape the backyard, so leaving the hives on the ground was undesirable. Finally, the internet offered a solution. We found a heavy duty outdoor stairway which we could install for roof access, instead of using ladders. Once that was in place, I was able to hire a couple of local beekeepers to bundle and move the hives up the stairs one box at a time (and at the time they were at 3 and 4 boxes high). Corky and Brady, the beekeepers, showed up early so the weather would still be cool and the bees huddled inside the hive waiting to start a day of foraging. Dave and I cut plywood to the dimensions of the boxes. The beekeepers strapped these pieces of plywood to the tops and bottoms of each box, and carried them (they weighed 40ish pounds each), up the new stairs to their new home on the roof. After an hour and a half of heavy lifting, the hives were securely in their new home on the roof. The next step was letting the bees know that their home had moved. As they were (mostly) happily in a closed dark box for the move, their natural response to the move would have been to leave the hive as if nothing had changed, forage, and return home – to the former location. To dissuade this behavior, we obstructed the landing board of each hive with branches. Many of them. The bees were forced to climb over and through these many branches before they could fly off. According to natural beekeeping guru Michael Bush, doing so would give a clue to the bees that they needed to stop and pay attention to their surroundings so that they could find their way back to the new hive location. Otherwise, I ran the risk of having all the forager bees return home to the old location. The branches were like a signal – hey something is different! Pay attention! It worked pretty well, with most of the forager bees returning to the rooftop at the end of the day. However, some of my bees did not get the memo, returning to the old hive location. So, for 3 days I left a small nuc box at the old site. Each evening, I would take the nuc box upstairs and shake the disoriented bees into the smaller hive. After 3 days, I gave up. Some of those bees just weren’t learning. Too bad for them. The remainder settled into life on the roof. The hives are now located right outside Soren’s window, so I can peek at them frequently to see how things look on the landing board. I do this a lot. After a few weeks of watching the bees, I realized that Galactica hive (the smaller of the two) had fewer bees entering and exiting the hive than Themyscira. A LOT fewer. I had been inspecting the hives regularly, so I was pretty sure that I hadn’t missed a swarm. The queen had been laying in a pretty consistent manner. I opened up the hive and it felt empty. But there was the queen, laying away. I found several frames of broods. Foragers were returning to the hive. So what was wrong? I didn’t know, but some instinct told me to borrow brood from the hive next door to bolster Galactica. These days I rarely make a hive-related move without consulting my bee group. 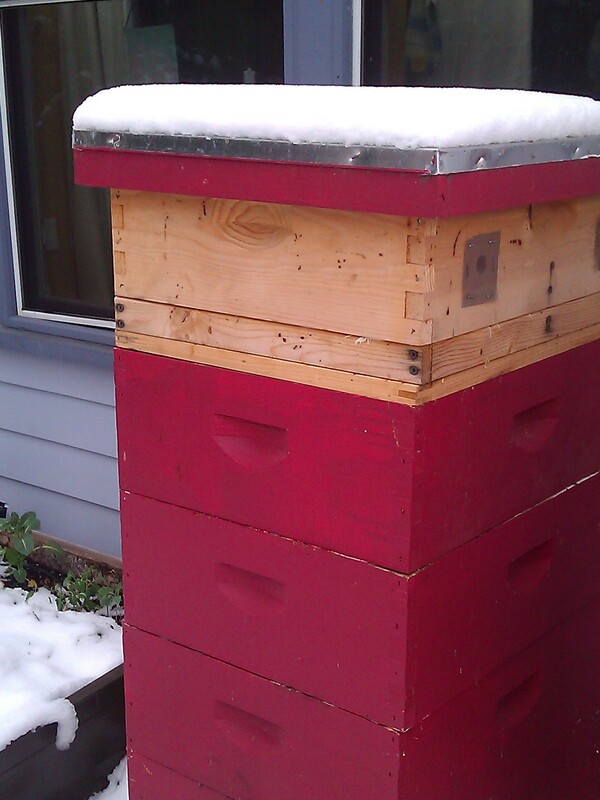 I emailed the listserv to inquire about the wisdom of propping up my weaker hive with brood. The consensus was that I had nothing to lose (except, potentially, a couple frames of brood). The biggest debate was whether or not to move the nurse bees over with the brood or shake them off first. Given the emptiness of the hive, I opted to move the nurse bees over with the brood. I was concerned that there were too few adult bees in the hive to keep the bees properly warmed. The hive accepted the brood and nurse bees without problem, and after a few weeks seemed to be back on its feet. So what was the problem? My current theory comes from fellow beek Patti who wondered if drift could be responsible. Drift occurs when the hives are close together and one queen is sending out stronger pheromones than the other. I suspect that Themyscira’s queen has always been the stronger of the two. In fact, that hive may have gotten off to a stronger start because bees from Galactica drifted to Themyscira when I was first setting up the hives. Luckily Galactica’s queen is a scrappy thing and keeps plugging away no matter the odds. Currently the landing boards on both hives show lots of activity. I’m due for an inspection this week, so I should have a better sense of how well the hive has recovered soon! Well, thanks to a mild winter, my handy-dandy bee quilts and dumb luck, it appears that both hives have survived winter. These warm afternoons have brought my bees out in droves, and they have been returning to the hives laden with pollen. The bright gold crocus pollen was particularly lovely. I’ve heard that March can be a tricky month for bees, so I will have to wait and see, especially since we will be moving the hives up to the roof in a few weeks. Won’t that be an adventure! Luckily one of my bee-mentors, Corky, is going to supervise the operation. Over the winter, neighbors Kevin and Laura started a new bee-keeping group for our neighborhood. Who would think there were enough bee-keepers in Wallingford to sustain a group? But it looks like there are! Now here’s hoping there are enough flowering plants in Wallingford to sustain all of our hives. I imagine we will be experimenting with the beehive saturation point for a neighborhood if interest in backyard bees continues to grow. 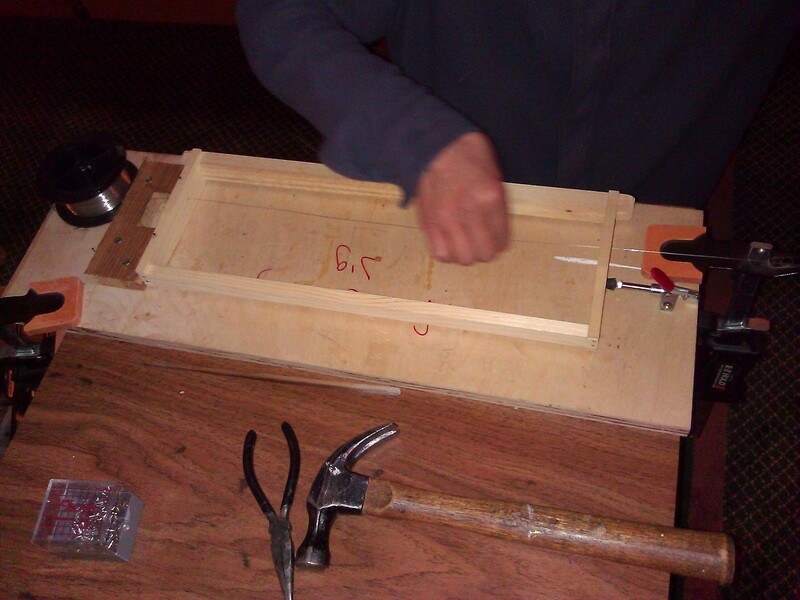 Kevin uses his wire jig to complete a frame. At our last meeting, Kevin showed of the fabulous frame jig that he made. We are hoping as a group to share tools and techniques, which I am really grateful for! It is nice not to reinvent the wheel, especially if someone who lives 3 blocks away already has a jig. The farmers at Milkwood led me to this free e-book about bees, written 100 years ago. You can read online or download it. I’m looking forward to exploring this one with the kids, and to comparing what we know now with what we knew about bees 100 years ago. It’s not brood, it’s foul! I finally made some time to check on my mason bee cocoons a few weeks back. 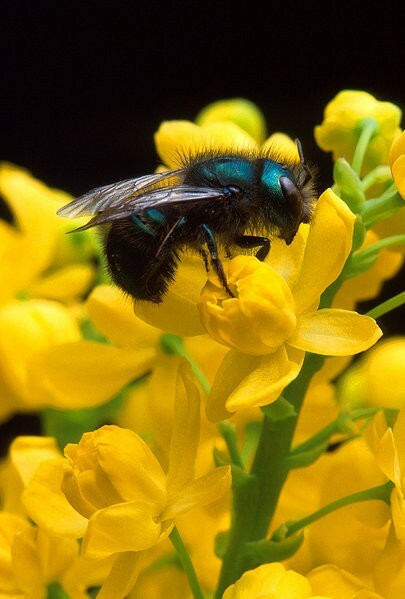 Mason bees are native stinger-less bees that live solitarily (not in a hive). They are great pollinators, and like most bees, need some support from the human community so that they can stay off the endangered species list. Back in the spring, I put out a bee house and some cocoons that I had purchased. The cocoons hatched readily. For the next month, the kids and I watched the female bees return to the bee house to fill our cocoons tubes with mud and eggs. After letting them mature in the bee house for a few weeks, we moved the tubes indoors to prevent predators and parasites like birds and wasps from destroying our larvae. If we do this properly, the larvae will grow, metamorphose and hibernate until spring. 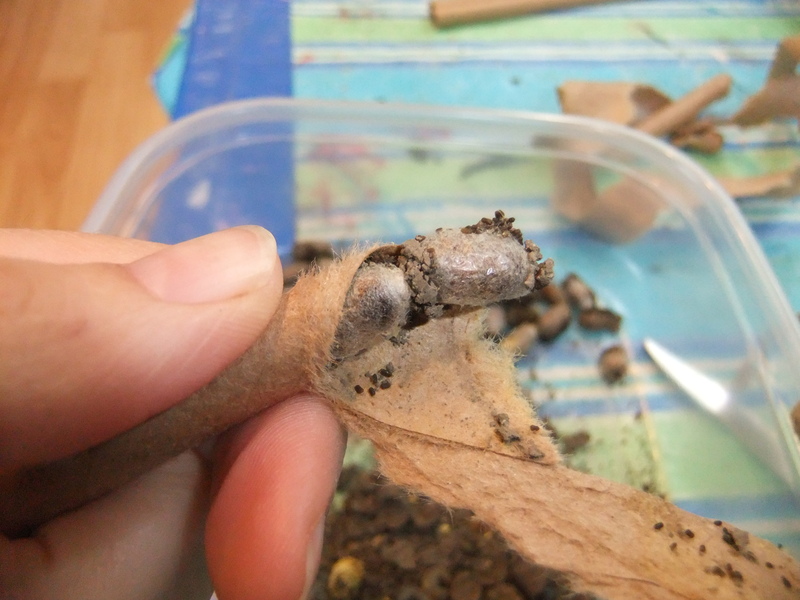 Opening the tubes reveals cocoons. So good so far! The local bee guru who provided me with last year’s cocoons recommended opening the tubes and storing the cocoons someplace cold for winter. Opening the tubes gives you an insight into how many eggs were laid, how may male and female cocoons you have, and if there have been any problems. Inside the first few tubes, things were looking great. A nice mix of male and female cocoons, properly formed. 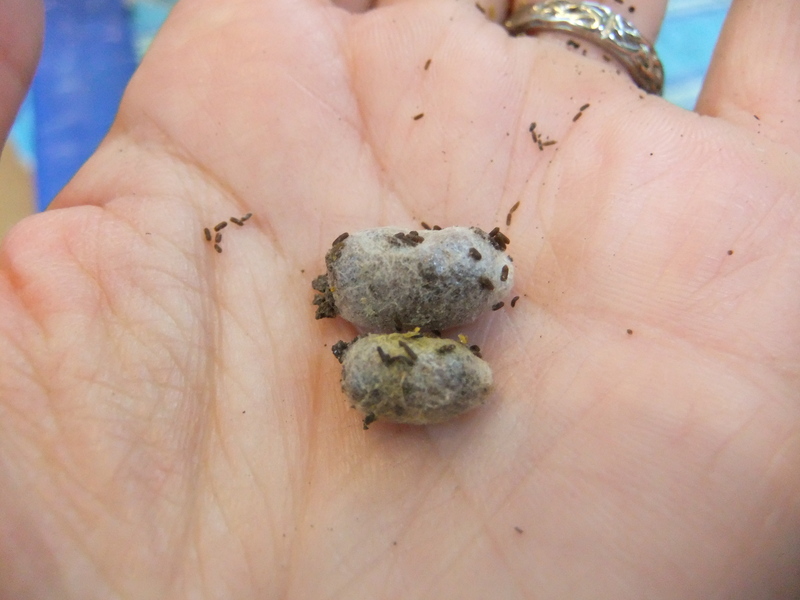 The female (larger) and male (smaller) cocoons. 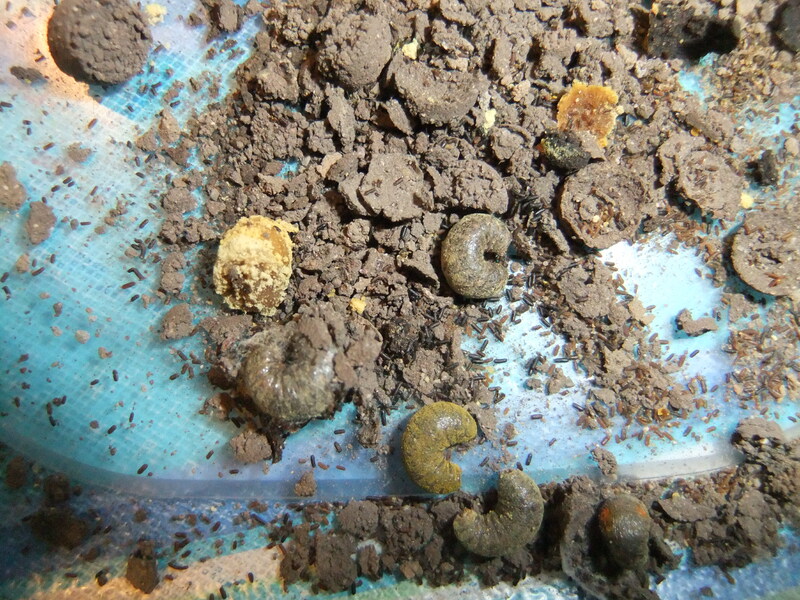 Fossilized larvae among the mud. Turns out that I didn’t have worms in my tubs, I had fossilized bee larvae, victims of a spore called “Foulbrood.” The good news is, it’s species specific, so my honey bees aren’t at risk. The bad news is, it’s a spore that gets everywhere. So, by mixing the dead larvae with the cocoons, I contaminated them. The bee guru recommended soaking the cocoons in a dilute bleach solution and hoping for the best, which I have done. I also have to sterilize the bee house with bleach and dump the leftover tubes instead of reusing them. So, once the holiday rush is over and I start dreaming of spring, I’ll bust out the bleach and get that little house cleaned up. Then we’ll see if any of those cocoons survived the bleach bath!